Our 5 day pack free Kakadu and beyond guided walk explores the spectacular stone escarpment and dramatic scenery of Kakadu in the Northern Territory of Australia.This timeless place is the largest national park in Australia, covering almost 20,000 square kilometres and is home to over 2,000 plant species, amazing wildlife, hundreds of bird species and Aboriginal rock art paintings dating to prehistoric times. 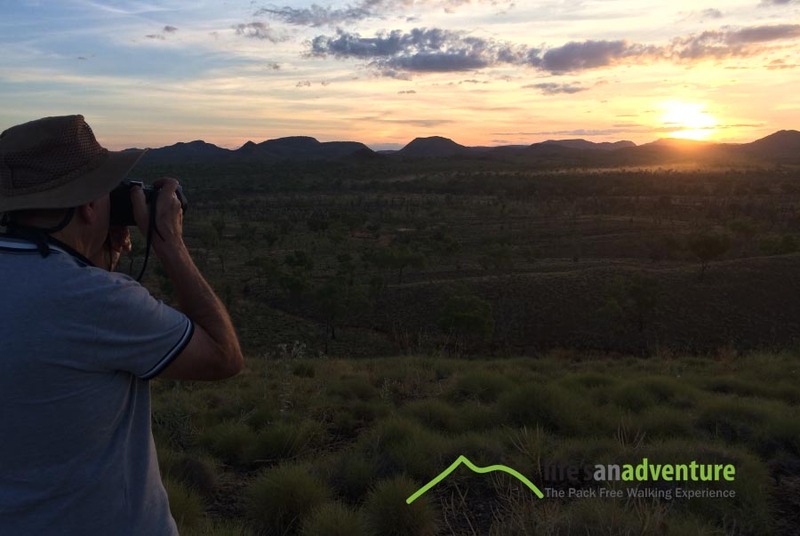 This 5 day walking tour has been designed to explore the best National Parks of Kakadu as well as Litchfield in the Top End of Australia. Kakadu National Park is made up of several regions including the East Alligator Region, Nourlangie Region, Jim Jim Falls region and Mary River region. 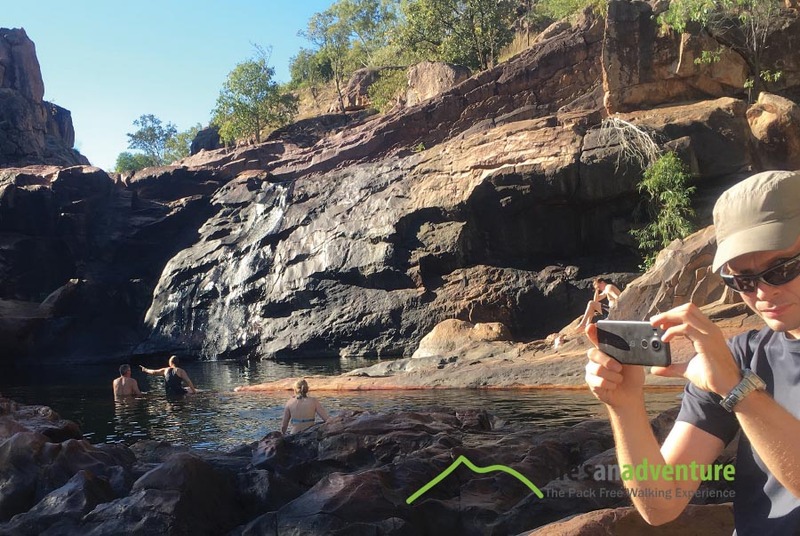 Our journey will ensure you have the complete Kakadu experience as we enjoy the best walks in all four of these special and unique areas. No need to carry heavy overnight packs or cook your own food, this walk has been designed for those looking for an affordable multi day walking experience with all the creature comforts. One of the biggest drawcards of this tour, is that our guests won’t be asked to carry their clothes or overnight bags for the entire tour, these will be transported for you each day. With Life’s An Adventure you will carry as little as your water bottle, camera and lunch each day! There is no better way to get an idea of the grandeur and beauty of Kakadu than from the air. This amazing journey includes a spectacular flight over the escarpment for magnificent views. Our group sizes are small and intimate with a maximum of 12 people, we find this delivers a more personalised service, a great social environment and has less impact on the environment. Our guides are truly exceptional at what they do. We call them our CEOs – Chief Experience Officers and it’s their job to ensure your tour exceeds your expectations. Our guide’s caring attitude and wonderful outgoing nature ensures your tour is relaxing, fun and informative. Meal time is a special time on tour. Not only does it provide the opportunity to get to know your fellow travellers in a relaxed environment, it also allows you to sample regional specialities. On tour we have many highlight dinners enjoy a special outdoor campfire dinner at Hawk Dreaming Lodge as we watch the sun go down and at Cooinda lodge enjoy outdoor dining under the stars with the choice of regional delicacies such as crocodile and emu. What Life’s An Adventure is renowned for? Most of all. 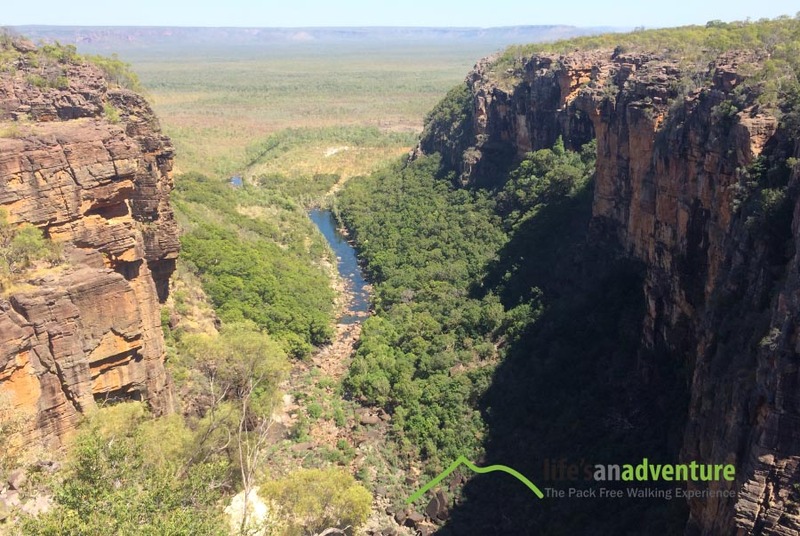 Walk all 4 regions of Kakadu National Park – you won’t miss the best! Total walking: 7kms. Grade moderate. Our journey begins at the Mantra Esplanade Hotel in Darwin where you will meet your guides at 6.30am. From here we travel to Litchfield National Park for the first of our walking adventures. This beautiful National Park is renowned for its stunning waterfalls which cascade from a sandstone plateau called the Tabletop Range. Today’s walk takes us from Florence Falls to beautiful Buley Rockhole. Along the track you will experience plenty of birdlife, including honeyeaters, kingfishers and pigeons. Besides birdlife, you might spot other wildlife as well including northern quolls and black flying foxes. Arriving at Buley Rockhole we stop for a refreshing dip in the crystal clear waters and watch the streams cascading over the rocks in this beautiful oasis. After lunch we continue walking to the lookout at Tolmer Falls, where you can view water cascading into a stunning pool below and linger in the rock pools above the falls. 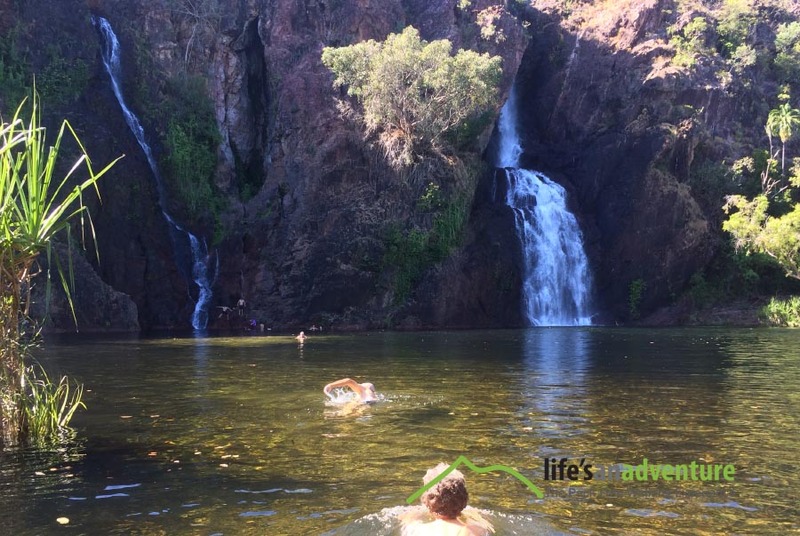 Afterwards we make a brief stop at spectacular Wangi Falls, surrounded by monsoon rainforest where you can enjoy a cool swim in the pool. Afterwards we head to our accommodation at Ringer Cabins, Litchfield Park set amongst the trees. In the evening we enjoy a hearty dinner served with wine and chat about the day’s adventures. Total Walking: 8.5km. Medium walk includes 250m climb. Enjoy a hearty breakfast before we farewell Lake Bennett. 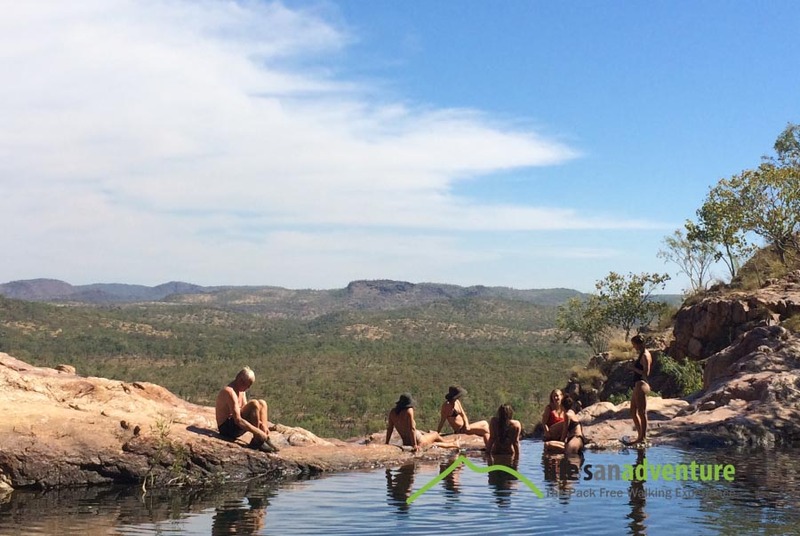 Our aim today, is to get you straight to Kakadu National Park so you can maximise your time in this special region with its spectacular sandstone escarpments and dramatic scenery. Kakadu National Park is made up of several regions including the East Alligator Region, Nourlangie Region, Jim Jim and Twin Falls region and Mary River region. Our journey will ensure you experience the best walks in each of these special and unique areas. Upon arrival in Kakadu we will enjoy a fantastic walk in the East Alligator region. Our walk today explores this area with its stunning geology, walking through the rock formations makes you feel like you are in medieval castle ruins. This walks also takes you past cool caves, rock art and through pretty paperbark woodlands. The birdlife in this area is just magic and this walk has to be one of Kakadu’s great secrets. Most days you are unlikely to see any other people on the track, making it a wonderful peaceful place to walk. This afternoon we experience Kakadu through the eyes of the traditional owners on a cruise taking in the local bird and wildlife as well as the breathtaking river and escarpment scenery. An indigenous guide will provide insight into their culture, traditional uses for plants and animals. Our guests will have the unique opportunity to disembark in Arnhemland for a display of traditional hunting before returning to Kakadu. Hawk dreaming is Kakadu’s best kept secret. Situated in remote and restricted area of Kakadu, in sacred aboriginal territory, Hawk Dreaming Lodge offers a magical intimate stay in the beauty of stunning Kakadu wilderness an area abundant with wildlife. The accommodation offers “glamping” style tents, with ensuites and deck. 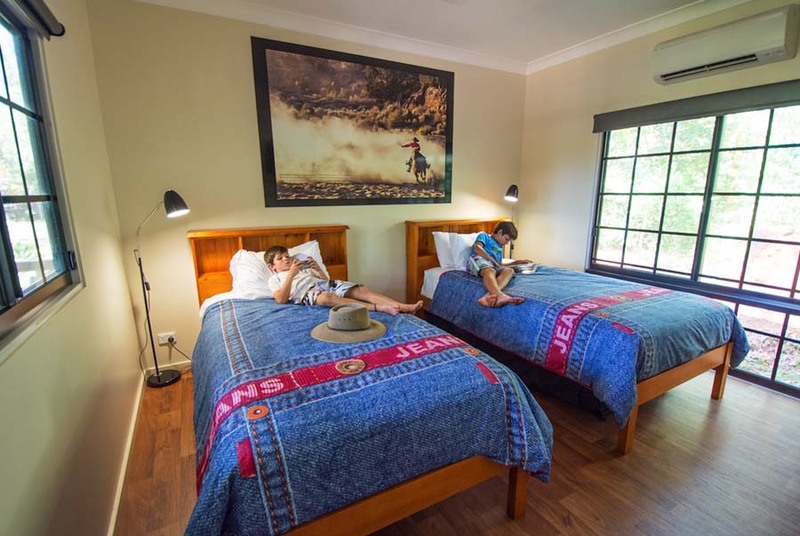 Your stay includes a personal tour of ancient rock art sites (not accessible to the general public) dating back many thousands of years, a memorable sunset over a beautiful billabong, all without the crowds and a relaxed authentic dinner with local produce. Hawk Dreaming wilderness lodge is a very special place and perfect for those who wish to experience the real Kakadu that lies beneath the tourist trail. Walking: 12 km. Grade: moderate. 6 hours. Easier option available 4kms. After an early breakfast we head off early to the Nourlangie Region for a dramatic walk in Kakadu’s Stone Country. Burrunggui or Nourlangie is a large sandstone island standing above the surrounding woodland. This 12km walk starts with a short walk to view spectacular Aboriginal Rock Art Sites dating back to pre-historic times including the Namarrgon lighting man. From here we head through sandstone country experiencing a variety of habitats and magnificent contrasts between lowlands and escarpment. Marvel at the great lookout points across the Arnhem Land Escarpment and look out for the native black wallaroos and chestnut quilled rock pigeon. Pass through heathland, layered sandstone pillars, and open woodland. Lavender-flanked wrens flit around the shrubs while peregrine falcons hunt from the thermals created by hot air rising from the rocks. 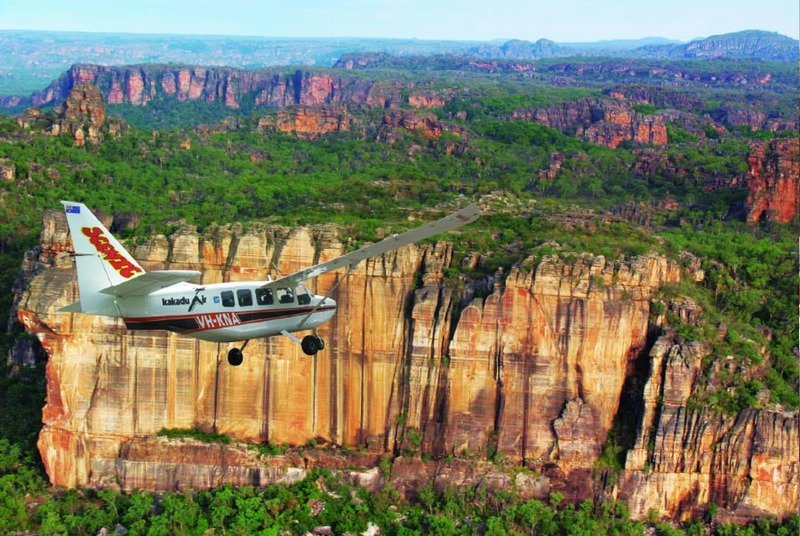 Afterwards we enjoy a scenic flight over the Kakadu Escarpment an amazing way to appreciate the grandeur and beauty of Kakadu. The next two nights are spent at beautiful outback resort of Cooinda Lodge beside Yellow Water Billabong. This wonderful lodge features a swimming pool and modern air-conditioned rooms with ensuite. Tonight we enjoy true outdoor Australian alfresco dining experience. Enjoy a wonderful menu featuring wonderful local produce such as barramundi and crocodile. Day Four: Jim Jim Falls walking and 4WD experience. Enjoy an early breakfast then we head out by 4WD to experience the remote and spectacular Jim Jim Falls, the crown of Kakadu National Park. Our walk is to the spectacular Jim Jim Falls gorge and plunge pools. 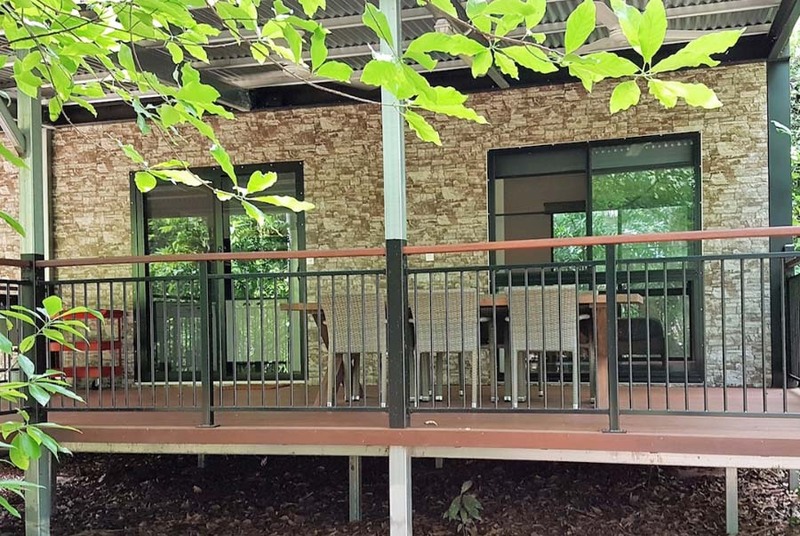 Enjoy a leisurely walk to the river where you will see views of the Jim Jim Falls gorge, you can relax here taking in the amazing views down the gorge or continue on. For those that wish to swim in the plunge pools at the base of the falls, the second half of the walk requires scrambling and rock hopping and requires a good amount of agility. The closer you get to the end of the gorge the more impressive it becomes and worth the effort to get there. Sit down and relax on the sandy white beach, take in your amazing surroundings and the pretty plunge pool surrounded by enormous vertical cliffs and after all that rock scrambling definitely go for a swim. We also have the option to walk to the top of the escarpment overlooking Jim Jim Falls for magnificent views. Afterwards enjoy the drive back to Cooinda taking in spectacular vistas of the Arnhemland Escarpment. Tonight enjoy a relaxing outdoor dinner in the lodge restaurant. Please note: Today’s touring is subject to the opening of Jim Jim Falls. If for any reason these areas aren’t open alternative locations will be substituted. Total walking 4kms. Steep Climb. After breakfast we set off to explore the Mary River region in the southern part of Kakadu National Park to walk. Today we enjoy a series of short walks with a refreshing waterhole swim the reward for each walk. 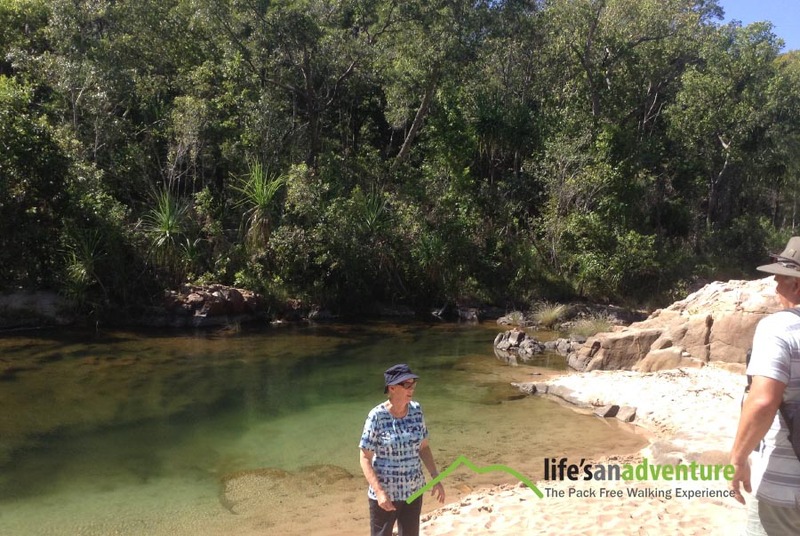 The first of our walks takes us to Maguk previously known as Barramundi Gorge an awesome gorge with a big plunge pool. The walk follows Barramundi Creek through monsoon forests with lush thick vegetation and interesting plants, birds and lizards to admire. Here we will walk to the head of the falls for magnificent views, the pool at the top of the falls is flanked by tall vertical cliffs then head on down to the plunge pools for a relaxing swim to cool off. Afterwards we head to Gunlom, a short walk will take you to the base of the falls, however we follow a steep track which takes us on a short walk to the top of the falls. 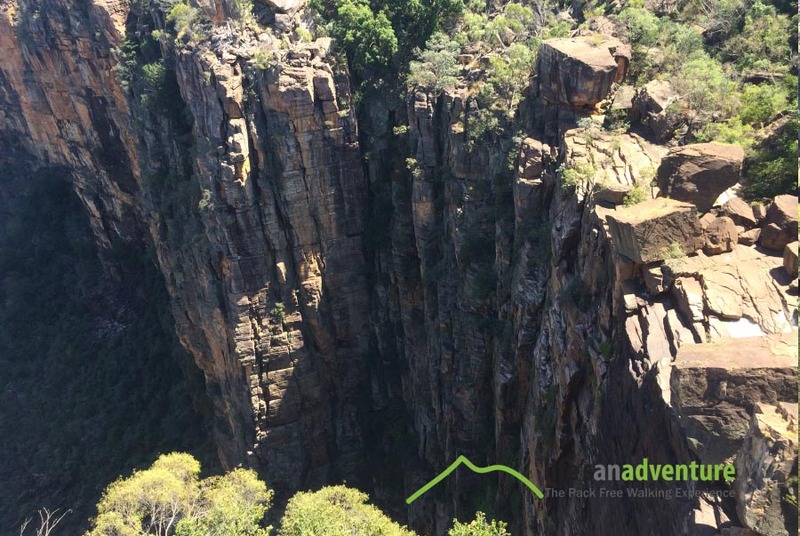 The views from the top over southern Kakadu are simply spectacular. When you reach the top you will be in need of a refreshing dip and what a spot for a swim. Natural infinity pools are found at the top of the falls providing the perfect place to relax – in fact you may never want to leave this amazing oasis. Transfers on our last day back to Darwin will vary depending on if we have any guests doing our 7 day tour (they spend 2 additional days in Katherine). If no guests are doing the 7 day tour the whole group will return via road to Darwin arriving at approximately 7.30pm. When we do have clients doing the 7 day tour, our 5 day guests will be dropped at Katherine Airport for a short flight back to Darwin (no additional cost). Upon arrival at Darwin Airport approximately 5.00pm, those guests not flying out that night, will need to make their own way back to the CBD via taxi. (13kms or 15 minutes). Feel free to enquire about this with our Reservation Staff when booking. 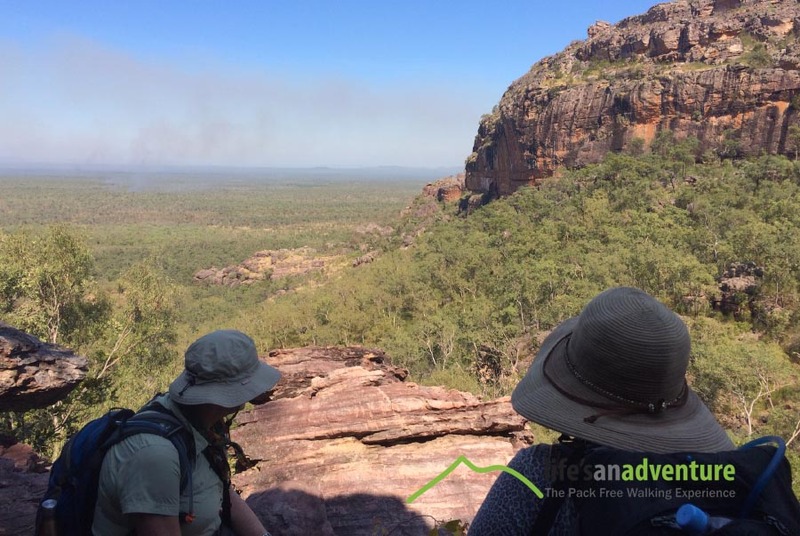 For those who want to extend their walking holiday for 2 nights, continue on and spend 2 additional nights in Katherine exploring the spectacular walking trails and gorge around this region. Click here to see itinerary. 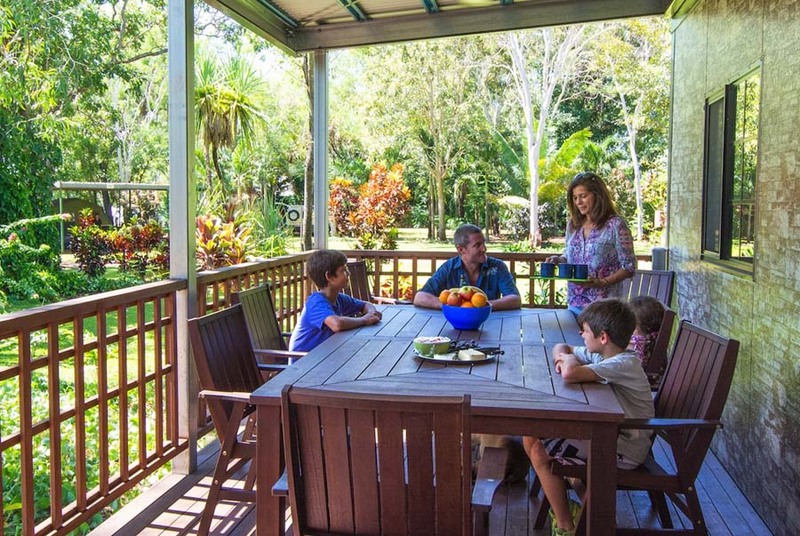 Our accommodation in Litchfield is at the Ringer Cabins’ Litchfield Park, set amongst the trees with large outdoor deck for enjoying the Territory lifestyle. The facilities also have a pool you can cool off after a day’s walk. 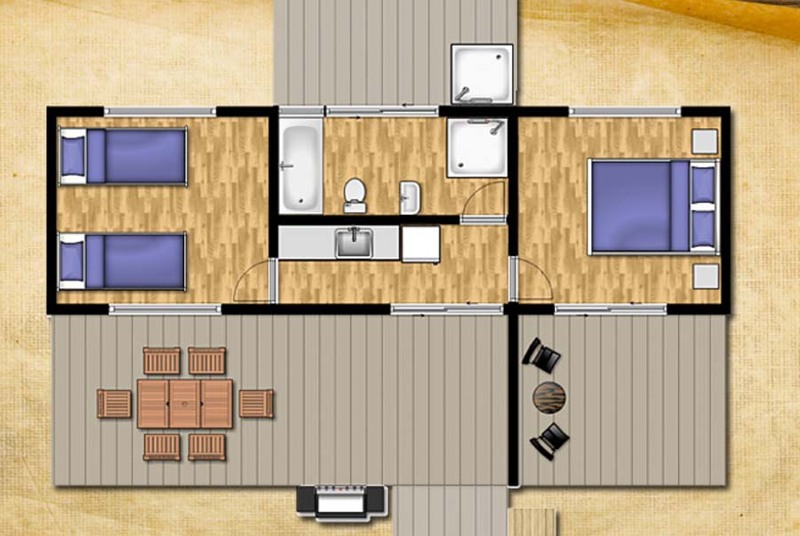 Guests will stay in 2 bedroom cabins. Main room has a Queen bed whilst bedroom two has two single beds. Please note Litchfield is a small town and has very limited accommodation, we have chosen the best available in this area. Your’ll find this accommodation clean and comfortable with close proximately to the trails. Hawk dreaming is Kakadu’s best kept secret. Situated in a remote and sacred aboriginal territory the general public do not have access to this special restricted area so our stay here will be a special treat. Hawk dreaming offers a magical intimate stay in the beauty of stunning Kakadu wilderness. The accommodation offers glamping style safari tents with ensuite bathrooms. Our stay included a personal tour of ancient rock art sites and a memorable sunset over a beautiful billabong. Hawk dreaming wilderness lodge offer warm hospitality and a special place perfect for those who wish to experience the real Kakadu that lies beneath the tourist trail. We’ve chosen 2 nights at Cooinda Lodge for its close proximity to the amazing walks of southern Kakadu. 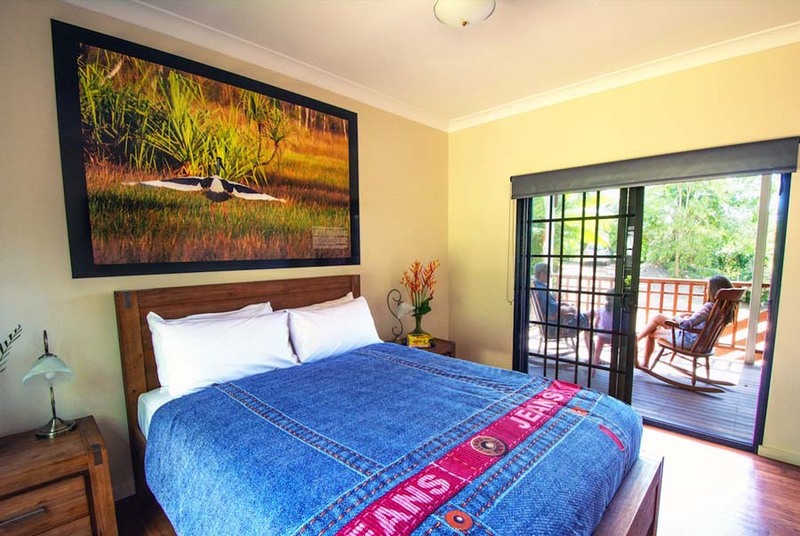 This beautiful outback Lodge beside Yellow Water Billabong features a swimming pool to cool off after a day’s walk and modern air-conditioned rooms with ensuite. Dinners at the lodge are a true outdoor Australian alfresco dining experience. With a wonderful menu featuring an array of local produce such as barramundi and crocodile. Save $200 per person on all of the following dates when you book and pay in full at time of booking. Spot Specials Save $200 on specific departures only. Spot Special Deals save $200 per person on spot special departures see availability page for dates. Book and pay in full at time of booking on specific departure. Book by 31 January 2019. $250 deposit required at time of booking. Note: * Jim Jim & Twin Falls are subject to these areas being opened. An alternative location will be included on this day if for any reason these areas are closed. A deposit of $250 per person is required to secure your booking. (unless taking advantage of Earlybird or Red Hot Specials in which full payment is required at time of booking). Early bird or Spot Special discounts cannot be used in conjunction with another offer. To receive these special discounts, full payment must be made at time of initial booking. Cancellations are not permitted for Earlybird Deals or Spott Specials, however transfers to another date are permitted 8 weeks or more prior to departure. We advise taking out travel insurance, in case unexpected circumstances prior to the trip, prevent you from joining this tour.